I would love to thank faceoftheday7 for nominating me for the One Lovely Blog Award. She has a super great makeup blog, check her out here if you get the chance! The way it works, is i share SEVEN facts about myself and nominate other bloggers to do the same. It is a great way for people to get to know a little bit more about each other. 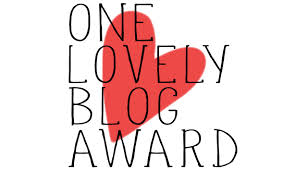 Display the award logo on your blog and follow the blogger who nominated you! Love your blog, I have nominated you for a blogger award. Please go have a look on my blog! You’re welcome! Ill check it out now! I’m 5’10”, I hated being tall the first half of my life but I feel like now its a built in way that you make an impression on people. If you’re interested, I’m starting a new link party over at my blog on Tuesdays- id LOVE to have you share a post! I love being tall now too! And I’ll check it out! Thanks girly!